This is the 'Flagship' W.A.B. Award. Since its inception W.A.B. has been traditionally based on a 10km x 10km grid square system, coupled with one of the Local Government Administrative regions. However, persistant changes to Local Government names, boundaries & types of authorities impacted on W.A.B. This was found to be both disruptive and very confusing. 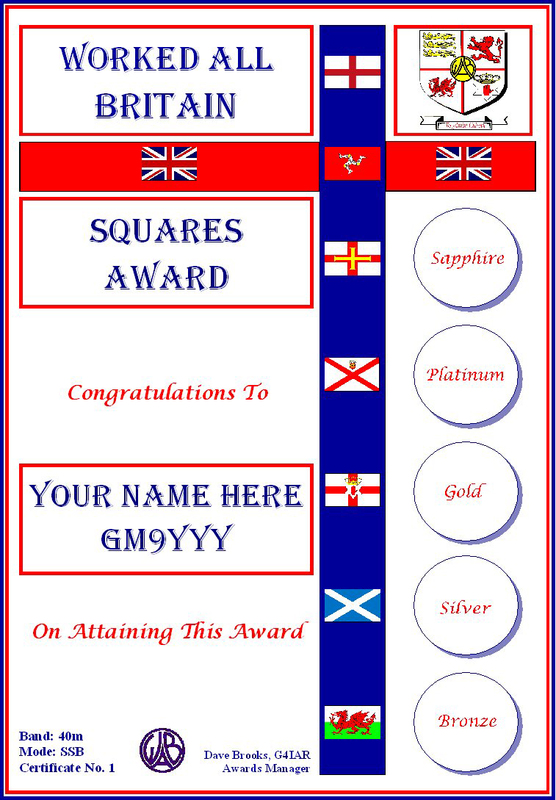 To coincide with our Ruby Anniversary year, it was decided to move to an award based on 10km x 10km grid squares and country boundaries. These would not be affected by local government changes. There are seven classes of the Award: Basic, Bronze, Silver, Gold, Platinum, Sapphire and Diamond, with an Honour Roll for those who have passed the requirements for the Diamond Award. Each can be claimed when the requirement is reached. The higher stages of the Award involve attaining requirements relating to other elements of W.A.B. The requirements are shown below. 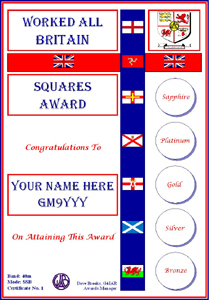 All contacts for this Award must have been made on or after 1st January 2009. Trophies attained relating to this award will be presented at the W.A.B. A.G.M. following their achievement. * Individual Book Holders, not Book Numbers.